Lungs, the debut album from Florence + The Machine truly took the indie world by storm, eventually gaining a much wider following in the mainstream. 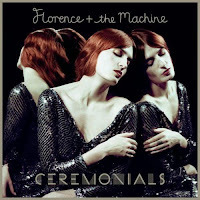 Undaunted by that success, Ms. Welsh and company return with their follow-up album, Ceremonials, on November 1st. Florence hasn't missed a beat. She shows off her big lungs throughout the album with her trademark bold, rich vocals. The soulfulness comes shining through on the enthusiastic, almost spiritual "Lover To Lover". She demonstrates a previously unseen softer side with the grand and hopeful "All This & Heaven Too". The lead single, "Shake It Out" lulls you into a false sense of calm, starting life as a sleepy little number. That is until Florence reaches out and shakes you awake with her chorus vocal. It's tempting to focus completely on Florence. While there is absolutely no denying that she is a charismatic and powerful frontwoman, this likes of which we haven't seen in a long time, The Machine deserve a lot more credit than they get. It's the smoldering arrangements that the band construct that often make the difference with these songs. They have a gift for creating bold sounds and compelling rhythms that still allow room for the listener to crawl inside the song and take part in it. Many bands can build an impressive wall of sound, it takes extra care to make the listener feel as though they are being let inside and protected by that wall. The band create a haunting occult atmosphere for "Seven Devils", making it seem like a perfect theme song should anyone choose to remake the film The Craft. "Never Let Me Go" has a groove so subversive that you won't even realize that your toe is tapping until 3/4 of the way through the track. The arrangements and vocals mesh perfectly on the album closer "Leave My Body". The track whisks you away into another world, with one of Florence's most soulful vocals to date and an aural kaleidescope of music. The pop sensibility that reared its head from time to time on Lungs is mostly absent on the new record. There's an attempt with "Breaking Down". That song, unfortunately, comes with a slightly '80s vibe that makes one think of a similarly titled Tears For Fears hit. Ceremonials may not be a quantum leap from Lungs, but as a sophomore album it serves it's purpose well; it reinforces the standing of Florence + The Machine and proves that their success is not a fluke. Best tracks: "Leave My Body", "Lover To Lover"